Such a pain to make, but sooooo worth it in the end. I will read your words while it’s baking. Oh, Moussaka. I feel like I’ve never had really really good moussaka until I made it myself. Maybe Greek restaurants just leave it on a warmer in the back and it dries out. Or maybe it’s because I never appreciated it until I knew what all went into it. So let me preface this recipe by saying: this is not a weeknight dish. This is not a dish to make on the weekend when you’re shuttling kids to soccer games all day. This is akin to coq au vin: it’s not difficult, but requires a lot of steps and slow cooking. It’s great to make when someone else is shuttling your kids around to soccer all day and you have the house to yourself to slowly sip a glass of wine as you relax and make your family something both wonderful and nourishing. I think it goes without saying if you really don’t like to cook, this might not be the dish for you to cook on your day off. I love a beautiful eggplant. So pretty! I cut some time off this dish by broiling the veggies instead of pan frying the eggplant and boiling the sweet potatoes, which also cuts the fat somewhat (if that concerns you). You can also make the meat sauce the day before, which cuts the time somewhat but is probably the easiest part of this dish and it pretty much just bubbles while you prep everything else. You could probably double batch the meat sauce and serve it over pasta the first night, then BAM! The next day half your moussaka is already done. I would like to note that for all the work, it does yield quite a lot and probably freezes pretty well. I filled an 8×8 and 9×13 pyrex dish, yielding 21 small-ish squares, so it’s good for a crowd and since it bakes for an hour before serving you have plenty of time to clean up and get ready for arriving guests. I found some grilled eggplant in the freezer section at Central Market (it’s an H.E.B product so it can be found there too) that I will try with this dish to see if it holds up. My mother-in-law made us a lasagna of sorts once using the frozen grilled eggplant instead of lasagna noodles and they held up pretty well, so I’m hopeful. When I get around to a remake, I will post in the comments as to how well this worked and how much time it saved. My fingers are crossed that it doesn’t sacrifice on flavor and consistency, since most of the flavor is in the béchamel and the meat sauce anyway. Turn on the broiler. 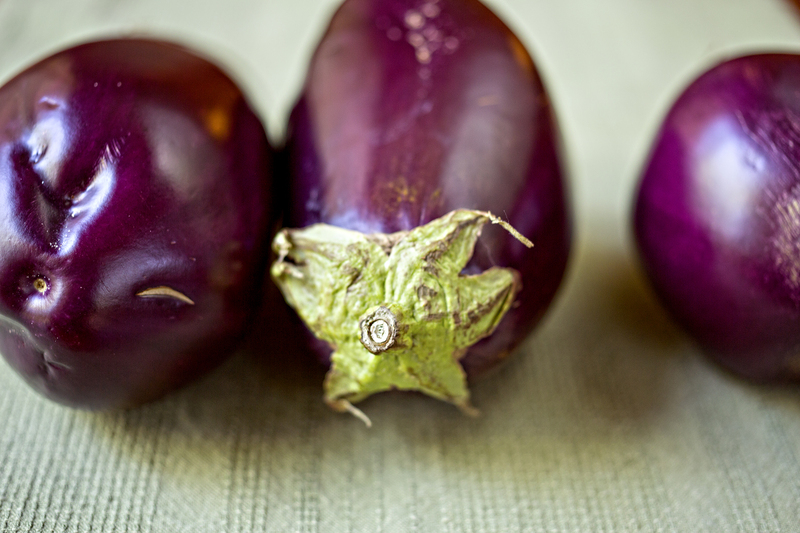 Lay your sliced eggplant and sweet potatoes on a few foil lined pans and spray (or drizzle) with olive oil. Working in batches, broil the eggplant until starting to brown, flip and repeat. Remove to a plate and reserve for the end. While waiting to switch out the eggplant and sweet potatoes, start the meat sauce. Heat 1 T of olive oil in a saucepan over medium heat. Add the bay leaves, cinnamon stick, a little salt and onion and cook until translucent. Add the ground venison, brown, then cook, stirring occasionally until all the liquid the meat releases is gone, about 15 minutes. Add the tomato paste, ground cinnamon, ground nutmeg and ground cloves, and stir and cook until everything is incorporated and starting to caramelize, about 2-3 minutes. Add the vinegar, sugar, tomatoes and 1 cup of water. Bring to a boil, reduce to a simmer and cook partially covered until most of the liquid has evaporated (and until you're finished with everything else) - about 30 minutes. Heat the butter in a saucepan over medium heat. Once it's all melted, add the flour while whisking and continue to cook and whisk until smooth (1-2 minutes). Add a heavy teaspoon of salt and milk and cook, whisking occasionally, until thickened, about 10 minutes. Remove from heat and put in a blender with eggs. Blend until smooth and reserve until ready to layer everything into a baking dish. Preheat the oven to 350. In one (or two, if need be) baking dishes (I needed a 9x13 and a 9x9), pour a thin layer of the béchamel sauce and a little sprinkle of cheese in the bottom of the pan(s). Spread the potatoes in a layer over the cheese, then the eggplant over the potatoes, then cover the eggplant with meat sauce. Finish it off by pouring the rest of the béchamel sauce over the whole thing and top with the rest of the cheese. Bake until golden brown, about 45 minutes. Vegetarian substitution: Throw some vegetables instead of meat into the sauce to bulk it up. Something that will hold up to a lot of cooking if possible. You could also layer some spinach in it when you assemble it. 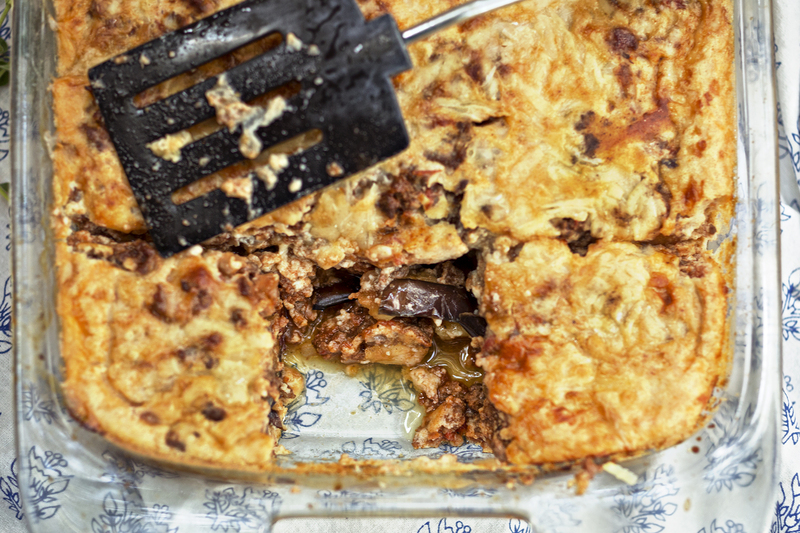 1 Comment on "Ground Venison Recipes: Moussaka"
This dish was so good, I had to go to confession!